Sometimes you need to call in the professionals to help you get a restaurant kitchen clean to pass inspection. SERVPRO of South Austin was contacted to help a family owned Mexican restaurant get back to clean again. Our crew was able to clean the ceiling, walls, floors and most of the cooking equipment to a point of almost new again. Food and grease have a way of finding hidden spaces in obvious places. Luckily we pay close attention to detail to make sure everything is completely cleaned. Call us to schedule an appointment and find out if we can help you 512-301-7765. We will send someone to your location for a walk through process and find out what we can do for you. Even small leaks can cause large problems when it comes to office space for rent. This commercial building had a small pin hole leak in a restroom on the bottom level that affected the maintenance room and the community kitchen for the whole building. 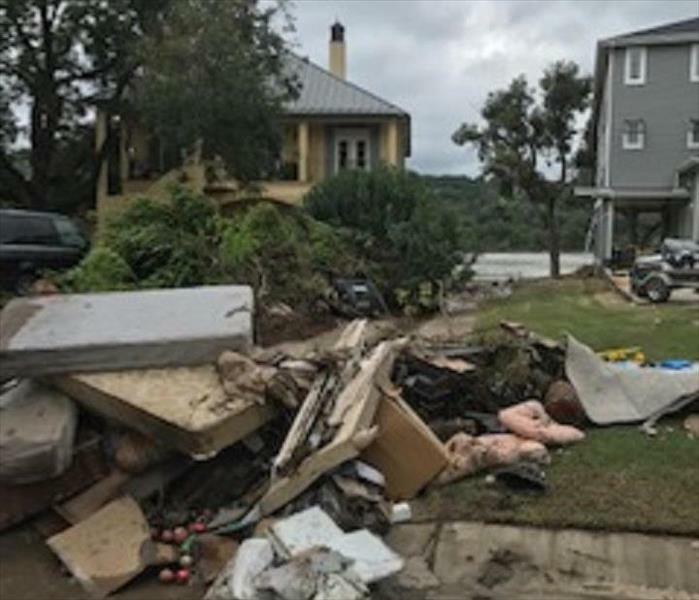 The property management company called SERVPRO of South Austin for remediation to the areas that had been absorbing the water. We were able to remove carpet, clean up all standing water and dry out the lower level of the building within 3 days. The building management company was thrilled with how quickly we got the job done! Call SERVPRO of South Austin 512-301-7765 for any mold remediation, water mitigation, fire restoration or bio hazard clean up you may have. 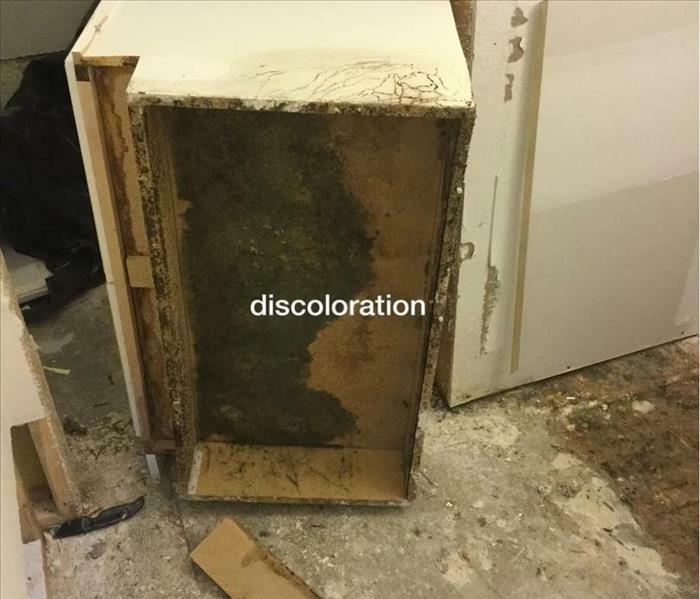 This picture is of a bathroom cabinet of which the sink had an slow ongoing leak for a few months before it was discovered. You can tell by the color and size of the mold that the leak has been there for a while. If the bottom of your cabinet is just wet, without mold, it will be the color of wet wood, otherwise it will be darker. SERVPRO of South Austin removed the cabinet and the all the pieces that were affected with mold. We also sprayed an antimicrobial solution to make sure any and all spores were destroyed. Call SERVPRO of South Austin today 512-301-7765 if you think you may have a mold problem from a slow leak in your home. A nearby town had a gas leak that caused many businesses and homeowners to evacuate immediately. 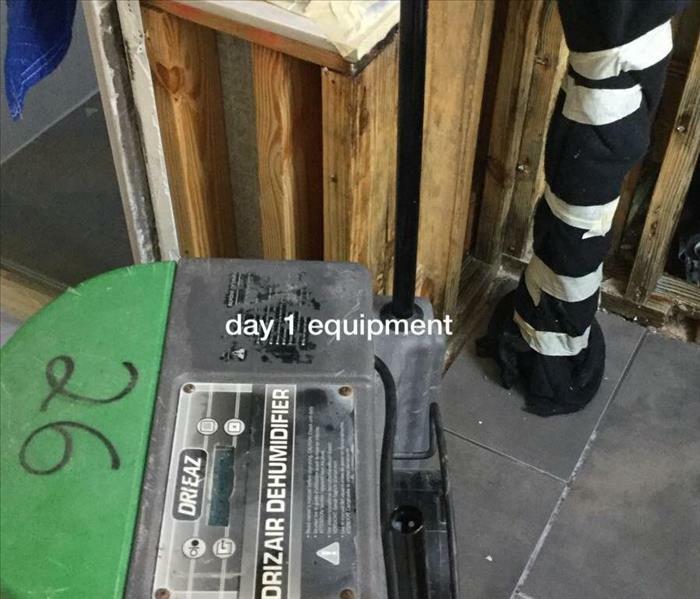 Some of the businesses were restaurants that had to leave everything as was being prepped for the day and walk away. The buildings have sat for three weeks with no power and no one allowed to enter them. Our crews knew what to expect when entering the first restaurant. A definite foul smell and a little mold on all the food sitting open on the prep tables. We took careful consideration when dumping all contents from the walk-in refrigerators/freezers and what was left in the fryers. Pressure washers and the proper chemicals took care of the rest. Call SERVPRO of South Austin 512-301-7765 to help you out! After the storm you can find all kinds of personal property scattered along a neighborhood. The strength of the flowing water is amazingly powerful as it pushes items with no effort. SERVPRO of South Austin has trained crews that know how to handle the debris that is becoming a bio hazard to the streets and in the homes. We can help you to verify what is worth restoring, clean up the trash, extract the water from the floor, remove the moisture from the walls and dry the home out. We are emergency respondent 24/7 to any kind of water, fire, mold or bio hazard situation. We always have a crew on call to be able to help you through. Call SERVPRO of South Austin 512-301-7765 for your emergency. This home was in the process of being built when the river rose. Fortunately there wasn't any furniture or memorabilia in the house yet. 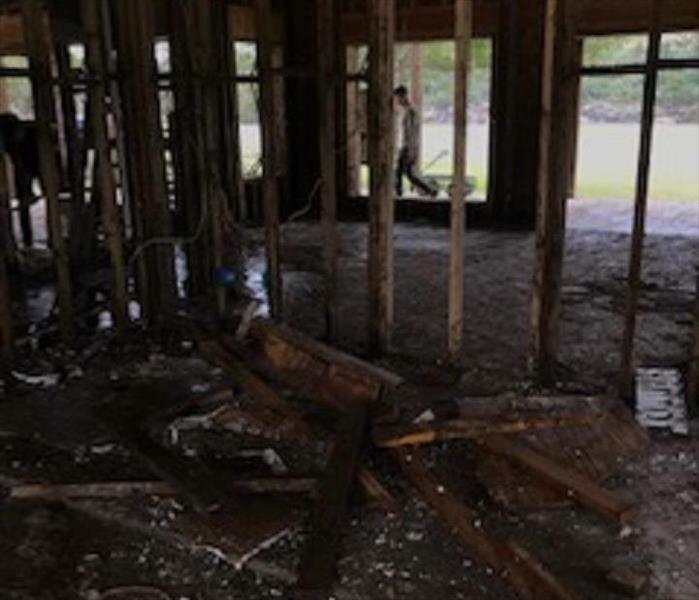 The Dripping Springs builder called SERVPRO of South Austin to go out and extract the water, mud and debris that floated in. We had to remove trees, rocks and personal property of other homeowners from along the water's edge. Our crews are trained to know what needs to happen first to last in situations such as this. There is a process to follow to make sure the structure is properly dried and treated. Call SERVPRO of South Austin 512-301-7765 for and information regarding help with cleaning up after a flood, fire or bio hazard situation. We are here to help 24 hours a day, 7 days a week. After most major storms we get flooded with phone calls from customers that have found out where their house has sprung a few leaks. It varies from corners of the house, to roof leaks, to window seals not keeping the rain out. In this picture, the homeowner called us because after a windy storm they found water on the floor of their utility room. The window was built many years ago and the seal around it had rotted. Since the storm winds were high, it blew the rain in enough that we had to extract the water and dry the room out. Call SERVPRO of South Austin 512-301-7765 with all of your emergency storm, fire or bio hazard situations 24 hours a day, 7 days a week. When water evaporates, it happens to cool the surface temperature of what is wet. The Infrared cameras identify temperature differentials in order to locate potential damage from the water. 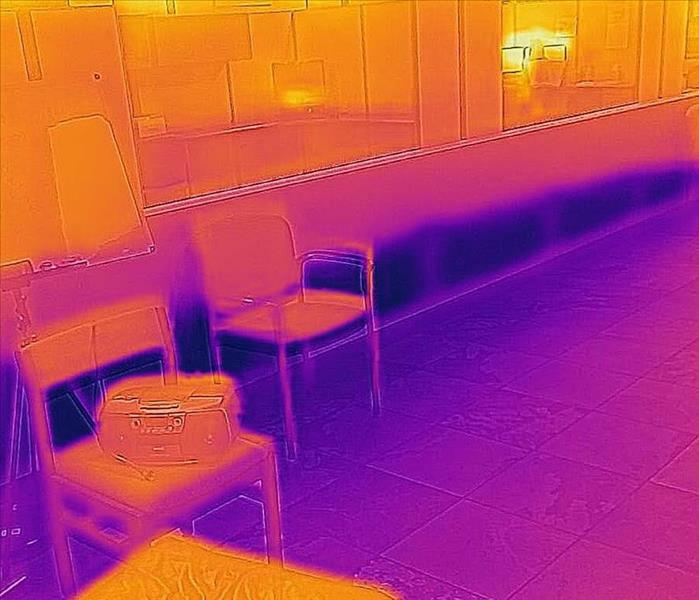 Infrared technology visually displays thermal differences using color (as shown in the picture). The purple areas are the water damage and the yellow areas are dry. This allows our technicians to know what area of the walls need to be removed and how much moisture is captured under the floor. The thermal accuracy is within 2% or -2% Celsius. SERVPRO of South Austin uses state of the art technology when at someones business or home. It's amazing to think such a small hose with such a small hole can cause such great damage. 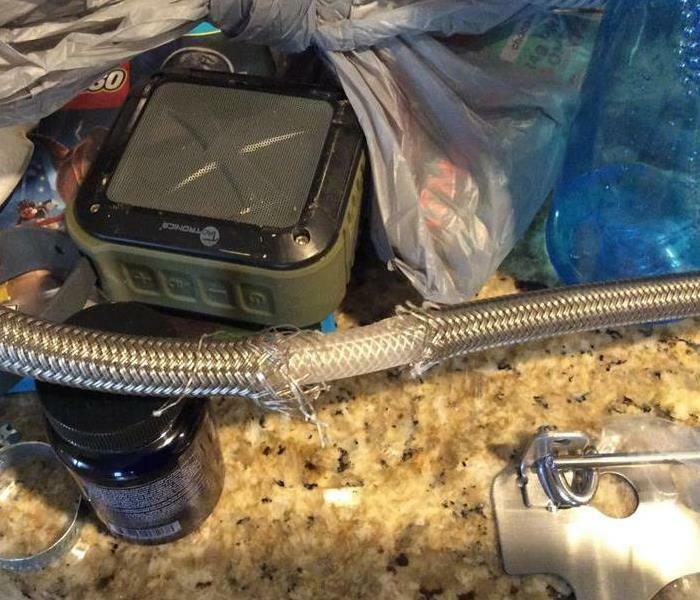 The dishwasher hose pictured is what caused an entire house to be flooded in every room. SERVPRO of South Austin was contacted to help the homeowners get their house contents packed up and dried out as quickly as possible. We sent a crew out to pack up items that needed to be stored in our facility temporarily. We also worked to move furniture out of the home because all of the flooring had to be removed. 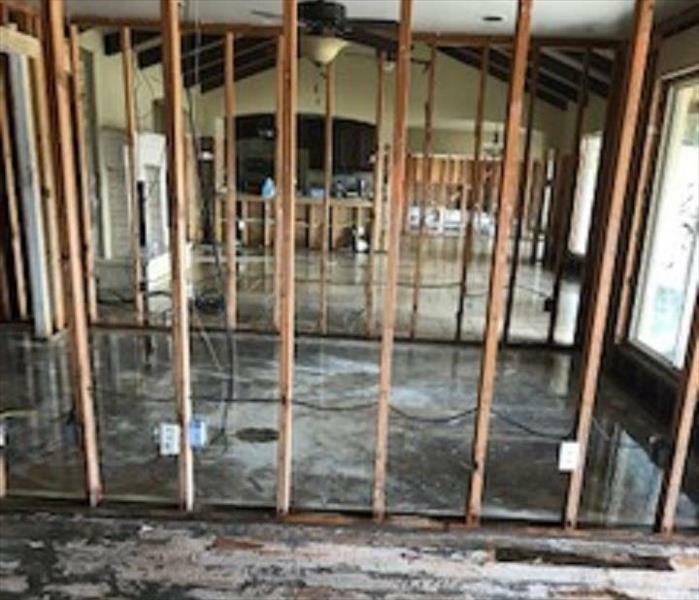 SERVPRO of South Austin can help with drying out your home, storing your items in our warehouse and also with reconstruction of walls and flooring that may have to be removed.